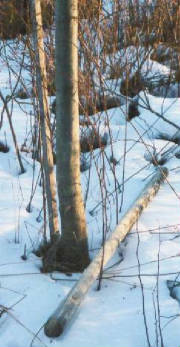 A row of five-year old grafted heartnut trees protected by Tree Pro tree protectors. "There are many problems with other, closed-type protectors, such as the one shown above. They attract mice and cause die-back and promote tree mold. What's worse, even if you're lucky enough to escape these problems, your tree could die anyway, like this cherry, strangled by the very device that was supposed to protect it. That's why I use Tree Pro instead." "By contrast Tree Pro protectors break open and fall off the tree when the tree gets large enough to put pressure on the lockties. Notice the tree protector lying on the ground." "This shows what happens when Tree Pro protectors are used. As the tree trunk puts pressure on the lockties, they snap. The first to go are the ones lower on the trunk where the girth is greater. Eventually, in another year or two, the top locktie will break and the protector will fall to the ground. Then I can pick it up and use it elsewhere on a newly planted tree. It truly is a great product." Black Walnut is our most valuable native hardwood. A single log once sold for $90,000. Unfortunately, trees like that are all but gone. Planting genetically superior cultivars has therefore become a very attractive investment. Since these trees are so valuable, they deserve the best protection. That's why only Tree Pro products are approved for use on these extraordinary trees. 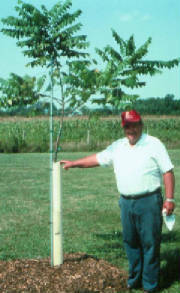 John writes: "Last fall I purchased 12 sawtooth oaks from a friend and he included your Tree Pro tree protectors. Luckily for me, he would not sell the trees without the protectors. The previous year I planted 24 trees and only three lived. This year all 12 are in great shape and have shown a 250 to 300 percent size increase since planting! Unreal!. I will never plant another tree without one!! Thank you! The ACC writes: "This summer we used Tubex, Tree House and Tree Pro protectors. For ease of installation, checking the seedlings' progress, opening up the tree shelter in the fall (to permit the seedling to harden off for the winter), and closing it up again for winter protection, Tree Pro is the best designed tree shelter."